A couple of weekends ago I bought myself a computer game – Don’t Starve. 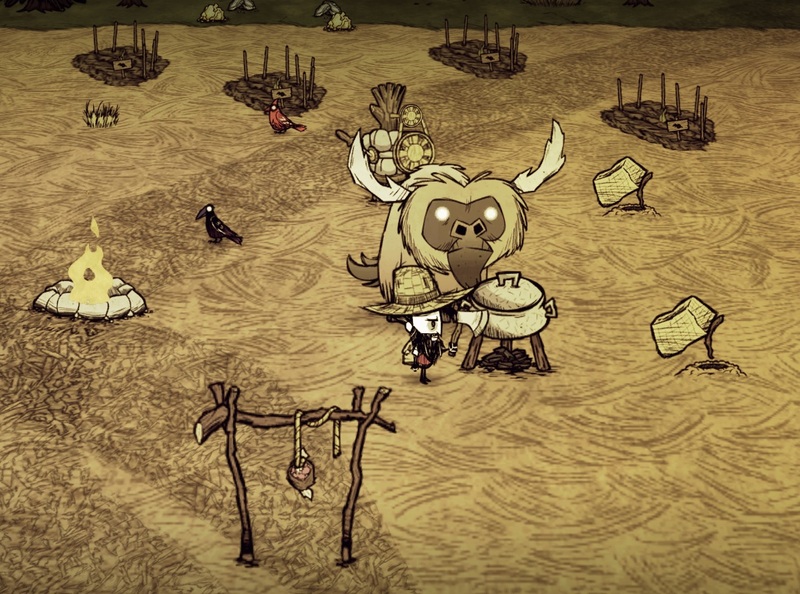 I had played the cooperative game, Don’t Starve Together, with the housemates off and on but never quite enough to my liking. But with this single player game I can play as much as I want, when I want. The game centers around you, a character who finds himself in the wilderness with absolutely nothing. It’s your goal to find materials to create items to survive as long as possible. Day turns to night before you know it and the only way to see and stay warm is to make fire. Hounds, spiders, and other monsters attack and do harm. I’ve died many times now, which generally means I have to restart from the beginning. It can get frustrating but for the most part I quite enjoy it and when I stop enjoying it, I stop playing. The longest I’ve survived so far is 23 days (when I died of cold). It’s a game of prioritization and planning ahead. I changed some of the aspects in my most recent game so I won’t have quite as many monsters, making it easier for me to survive. If you’re interested in playing it we can connect Steam accounts and you can play when I’m not on. My dude has got it going on! Wow! What a cool game.